interviews of everyone featured within. The group includes legends in design, media, technology and communications. I am wondering about some obvious omissions, such as Steve Jobs from Apple. generation of digital devices to be interviewed for this book. 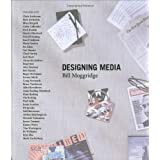 Want to learn more information about Designing Media?